Hello! 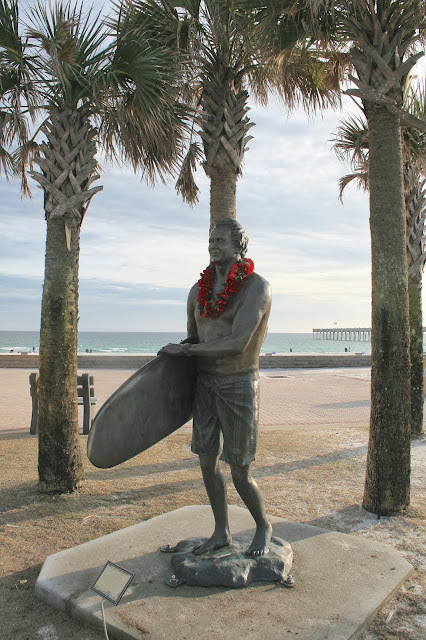 Today's post is a continuation of our holiday vacation in Pensacola Beach, Florida. If you missed my earlier posts, just scroll down! Our third day in Pensacola was New Year's Day, and because it was a holiday and a lot of places were opening later in the day or closed entirely, it was a very laid back day for us. Since we were up late the night before watching the fireworks, we slept in a little later than normal. After our usual morning spent on the beach watching the birds and collecting seashells, we then explored the small town of Pensacola Beach. Our first stop was the boardwalk. The boardwalk is a beautiful walk along the beach filled with cute shops, restaurants and bars. It was the same place we watched the 8:00 p.m. fireworks the night before. Many of the stores were closed for the holiday, so we had the place to ourselves, as you can tell by the photo below. On the back side of the boardwalk is a stage and seating area and a long pier. This is the view of the back side of the boardwalk as seen from the pier. 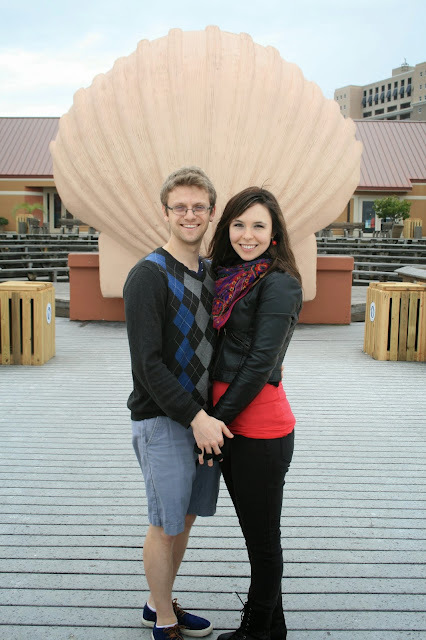 The back of the sea shell stage was the perfect backdrop for a photo! I was actually very nervous walking on this pier because there are no side rails and I don't swim. It is very shallow water until you reach the end of the first part of the pier, so that's where I stopped walking. The back side of part of the town as seen from the pier. Now I'm standing at the very end of the first part of the pier looking at the sea shell stage and the back of the board walk. Ashley and Jason are not afraid like me, and they casually stroll the left extension of the pier. We had the wonderful opportunity to see stingrays swimming in the water below the pier. After our morning on the beach and strolling the boardwalk, we went back to Shaggy's, our favorite restaurant in Pensacola Beach for lunch. Then we went to Florida's version of the Polar Bear Plunge. Now I can't even begin to tell you that as a Wisconsinite who has seen real Polar Bear Plunges when it's single digit temperatures or less and swimmers run into water temperatures that are about 40 degree's or less, that this was a hysterical joke to us. We could tell we were surrounded by locals on this sunny, sixty degree day when they kept saying around us "Oh it's so cold! I can't believe they are going in the water!'. The water temperature that day was about 60 degrees. That is the typical water temperature of our backyard river in the middle of summer in Wisconsin. So we chuckled at their version of a Polar Bear Plunge at their expense, but we had a good time watching them. Everyone seemed to be having a really fun time. After the Polar Bear Plunge, we then took a walk on the largest and longest pier in Pensacola Beach called Gulf Pier. This was the pier that the midnight New Year's Eve fireworks were shown from, and it is also the pier that you could see from our hotel and is many of my beach photos. I felt very safe on this pier because it had a railing. 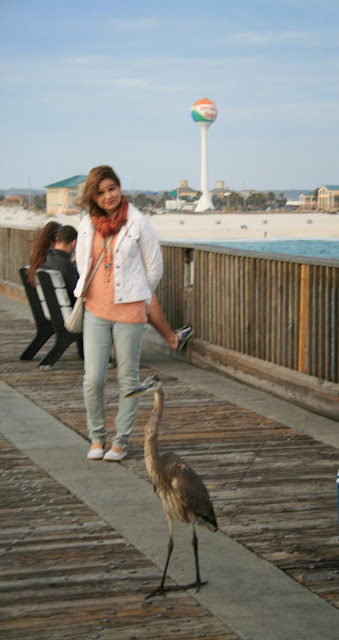 I made a little friend: a friendly heron who was just hanging out with the tourists that afternoon. It seemed like we had to walk quite a distance before we got to the end of this pier. It really extends quite far into the water. I took my Fashion Over Fifty pictures at the end of this pier, just as the sun was about to set. The first picture shows the view of the public beach as seen from the pier. The Pensacola Beach Ball Water Tower as seen from the pier. 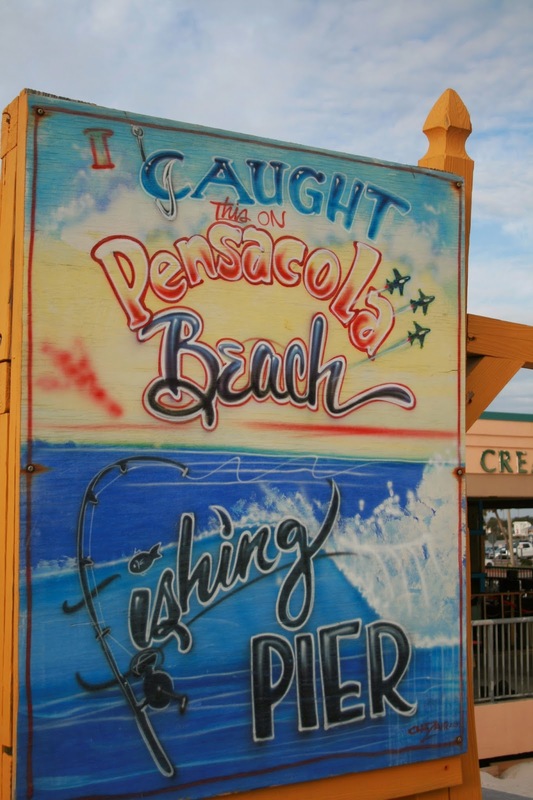 When you walk back off the pier, they have this lovely painted sign that you can take your picture of with the fish you caught on the pier. I love the colors and style of this sign. When we were done walking on the pier, we just walked around in downtown Pensacola Beach and took these pictures of all the public areas. This is the parking lot of the public beach area. I love the colors of the buildings in the distance. They do a lot of outdoor concerts and events during the tourist season. This is one of the seating areas of the public beach. A lovely memorial to a local hero of Pensacola Beach. When we were done touring the area, the 'boys' decided to do their own Polar Bear Plunge. They said the water was cold, but only about as cold as a Wisconsin lake or river during the summer. We ended our day in our usual fashion of bird feeding. We found out that these guys were pretty smart and started to recognize us every time we stepped out on the beach and come flying over! The pool water was very warm in comparison to the gulf waters. We ended our day going to a very interesting restaurant called Red Fish/Blue Fish. Out of all the restaurants we visited, this one had my favorite decor. These moving fish greet you in the window as you approach the restaurant. The restaurant seems to be a haphazard shack of corrugated steel and wood without much thought when assembled, yet is so creative and artistic, it really works. I love these hanging, glowing under sea creatures that greet you in the entry way. Red Fish/Blue Fish, like a lot of other restaurants in the area, seems to have few real walls. There is an indoor portion of the restaurant, which has walls only on one side, and a little heat from above heating vents, but it is only closed off from cold weather by these thick clear vinyl panels that they bring down only on cold days. You can see the panels in the picture below, they are edged in blue. Otherwise, in warmer weather the entire restaurant is open to the beach/outside and has a gulf view. The picture below shows the outside of the restaurant that is right on the sand and is filled with fire pits, chairs, and tables for sitting outside and enjoying your meal. We really enjoyed sitting next to the fire pit by the water and talking after our meal. And that is how we spent New Year's Day on Pensacola Beach. It was very relaxing and peaceful day. Sounds and looks like a fabulous New Years Day. Love your photos. Never heard about Polar Bear plunges. Can't believe people willingly get in water that cold! I think I would only do the 'pool', although the beach does look inviting!